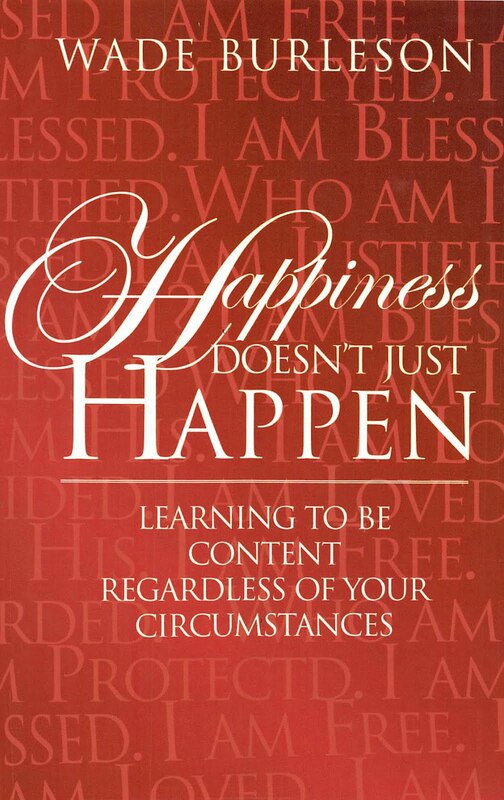 Righteousness is a big, important word that conveys one of the life's most vital concepts. The Bible declares that God is righteous. "O LORD, God of Israel, You are righteous!" (Ezra 9:15). "The LORD is gracious and righteous; our God is full of compassion" (Psalms 116:5). "The LORD is righteous in all his ways and loving toward all he has made" (Psalms 145:17). The Hebrew word translated righteousness has as its root the meaning of "right" or "straight." The Old English word used to translate the Hebrew word was "oughtness." God is right. God is straight. God is as He ought to be. To be righteous is to be right. It is to be a person who is not crooked in character or conduct. However, because of sin in all of us, there is "no one righteous, no not one" (Romans 3:10). Nobody is as we ought to be. We are not righteous in character, and we are not holy in conduct. Holiness is but the outward expression of internal righteousness, and without holiness "no one will see the Lord" (Hebrew 12:14). How then, does a sinner become righteous in the eyes of God? The word "impute" means to "credit to an account" of another. It is an accounting term. When God imputes righteousness, it means that God credits "righteousness" to the account of a sinner. How can I be seen by God as "righteous" when both God and I know that that I'm a sinner. "This righteousness is given through faith in Jesus Christ to all who believe" (Romans 3:22). God credits me with perfect righteousness when I believe in Christ. My trust (faith) is credited as righteousness to me" (Romans 4:22). "I am found in Christ, not having a righteousness of my own that comes from the law, but that which comes through faith in Christ, the righteousness from God that depends on faith" (Philippians 3:9). “For if, by the trespass of the one man, death reigned through that one man, how much more will those who receive God's abundant provision of grace and of the gift of righteousness reign in life through the one man, Jesus Christ” (Romans 5:17). You are declared righteous by God through the gift of His righteousness given to all those with faith in Christ. "Imparted righteousness" identifies the internal work of God when He regenerates those who trust in Christ. Believers in Christ become "partakers of the divine nature" (cf. 2 Peter 1:4). It is this principle of righteousness imparted to men in regeneration which is ever in conflict with the old Adamic nature. 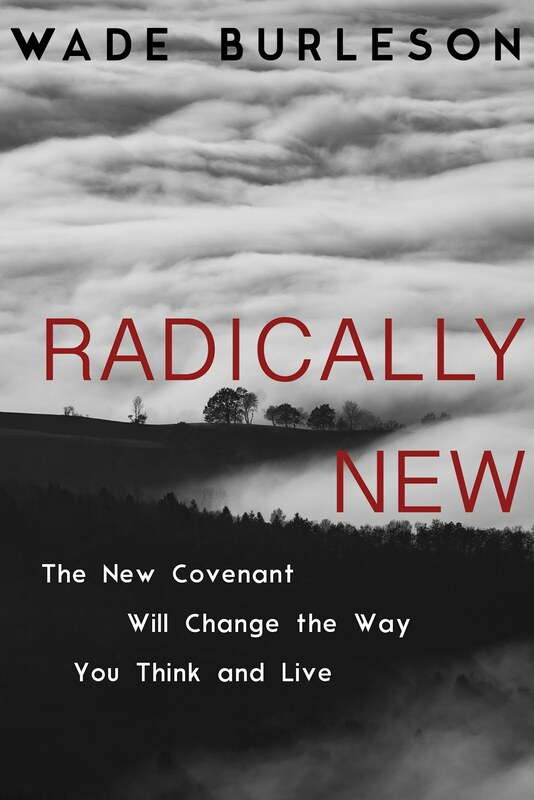 It is critical, however, to maintain the distinction between the "imputed righteousness" of Christ which is the basis for justification and this "imparted righteousness" which may be seen as the basis for subsequent sanctification. For all you English majors out there, imbedded is a legitimate variant spelling of embedded. To be imedded means "to fix into a surrounding mass; or to incorporate as an essential part or characteristic." When something is imbedded, it cannot be removed. The characteristics of that which is imbedded are seen in the mass in which it is imbedded. For example, when red dye is imbedded into plastic, you have red plastic. When paint is imbedded into canvas, you have art. When righteousness is imbedded into a sinner, you have a person who begins to pursue what is right. In essence, nobody has warrant to say they have been given the gift of imputed righteousness, and have in them the presence of imparted righteousness, until they life a life that shows evidence of imbedded righteousness. Nobody who knows Christ continues in their sin. We all sin. We who have received the righteousness of Christ have righteousness imbedded within us, and therefore, the characteristics of living right are always present - for we can't help it. It's imbedded within our DNA as followers of Jesus. A world cursed with sin produces people caught in pain. In my experience, my emotions are most traumatized by pain in others. I often handle better my own trauma than I do seeing others in pain, particularly those close to me. Maybe you feel the same. "What was God thinking when those thugs raped my daughter?" 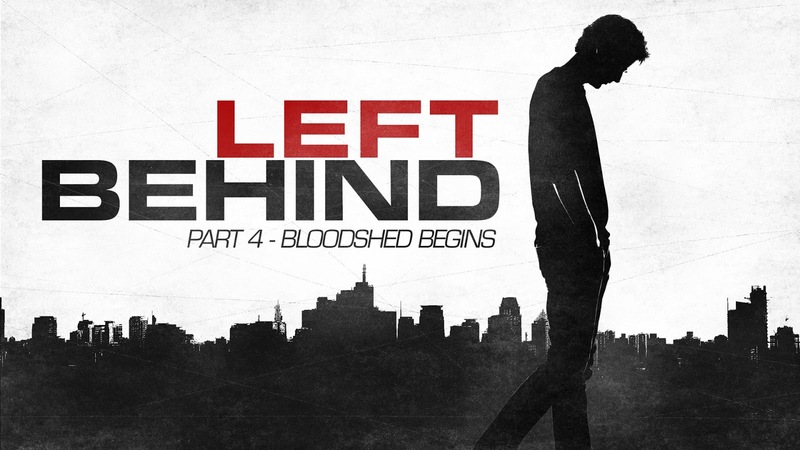 "Where was God during my husband's horrible accident that left him paralyzed?" "Why didn't God prevent the car wreck that killed my sister and her husband and left their three kids orphans?" "How can God allow my grandson to suffer through life with his physical deformities?" "How will God provide for my son and his family after he lost his job?" The frustration and pain we feel for others is often more intense than the pain we feel for ourselves. Adding to our stress in empathy is the despair we feel over events like what happened in Nice, France last week, or Dallas, Texas, the week before, or Baton Rouge, Louisiana yesterday. The deeper our creation descends into darkness the more it seems we have questions for the Creator of light. I love C.S. Lewis. His writing causes me to think. In his little known book The Horse and His Boy, there is comfort for we who feel for the pain in others. A friend suggested I read The Horse and His Boy to help families who watch someone they love suffer through a terminal illness. Those standing around the bed of a loved one who is dying are asking the question, "Why?" C.S. Lewis, in my opinion, has given the definitive answer in The Horse and His Boy. 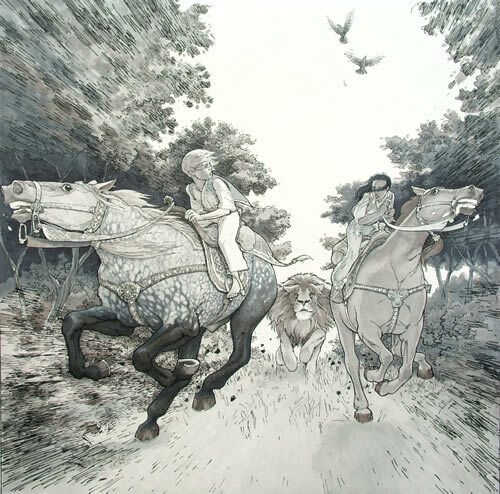 Lewis tells the story of two young slaves, Shasta and Avaris, who are riding their talking horses to the Land of Narnia. The attempted escape to Narnia began for Avaris when she poisoned her stepmother's servant, the one responsible for keeping Avaris in captivity. Avarice fled and then met Shasta on the road north, joining him in the escape to Narnia. 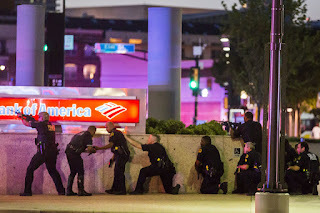 Several times disaster almost befell the two escapees. Each time a Lion intervened to rescue them. On one occasion, enemy forces came close to capturing Shasta and Avaris, but the Lion spooked the talking horses, causing them to run faster to escape the trouble. However, in spooking the horses, the Lion's paw injured Avaris. Her wound, though not fatal, scarred her. After safely arriving in Narnia, Avaris and Shasta discover that the Lion's name is Aslan, and He has been their Protector. After they discuss events during their journey where Aslan protected them from doom, Averis asks a probing question about her injury. "The scratches on your back, tear for tear, throb for throb, blood for blood, were equal to the stripes laid on the back of your stepmother's slave because of the drugged sleep you cast upon her. You needed to know what it felt like." The Lion revealed to Avaris that her physical suffering was intended to shape her inner character (see Romans 5:3-5). But, like we all have a tendency to do, Avaris turned her mind toward the injury and physical pain of another. She asks a question about the slave girl she drugged to begin her escape. "Will any more harm come to her by what I did?" "Child, I am telling you your story, not hers. No one is told any story but their own." It seems to me much of my maladjustment in a sin-cursed world comes from wanting to understand the reason for other peoples' pain. God is not in the business of cluing me in on any story but my own. In Hebrews 11, some of God's people conquered kingdoms, victoriously defeated the enemy, and prospered in this life; but others were imprisoned, beheaded, and suffered mightily, not receiving the blessings others of God's people received because "God had planned something better..." (Hebrews 11:40). God has the answers for the reasons for trauma and pain in all our lives. But no one is told any story but their own. It goes without saying then, that if He's uninterested in telling me any story but my own, then I should be intentional in not attempting to give answers to "Why" to those I love. I don't know; only they do - or will - and they will only know when Aslan tells them, not me. Jesus has the answers for the reasons trauma and pain are present in this cursed world. He alone can tell me my story from the position of Protector. He will not tell me any story but my own. I'm learning to listen to Him when it comes to my story and to trust Him when it comes to somebody else. The typical Christian in America feels no connection to the world as a whole. After we hear the message on Sunday morning, we will leave the corporate gathering thinking how the verses apply to us - today! While that's good, too many of us have no idea how to trace the practical application of a text throughout world history. Let me give an example from James 5. We read James' passage and see it as a caution similar to one from the Apostle Paul: "For the love of money is the root of all kinds of evil" (I Timothy 6:10). We tend to reflect on these admonitions as it applies to us individually, or at most to our family. But it seems to me an even fuller understanding of this passage comes from a knowledge of world history and our connection to it. James, the author of the book in the Bible, was one of Christ's early disciples. Millions of Catholics believe that after the death and resurrection of Christ, James traveled to the Iberian Peninsula (Spain and Portugal) to preach the Good News to the Hispanic people (Hispanic is the Roman Latin word for Iberian). James has always had a special place in the hearts of the Spanish people because of his trip to Iberia. Santiago is the Hispanic name for James, and the Camino de Santiago (The Way of St. James) is a pilgrimage to the Santiego de Compostela Cathedral in northwestern Spain to pay homage to the alleged relics (bones) of St. James. Throughout the Middle Ages, the Way of St. James was considered by Roman Catholics a pilgrimage on par with one to Rome or Jerusalem. It is without doubt that the gospel of Jesus Christ came to the Iberian Peninsula soon after the resurrection of Christ. Paul himself speaks of his wish to go to Spain (see Romans 15:24). The Good News spread quickly in the 1st and 2nd centuries AD, and the Hispanic people living in the southwest corner of Europe converted to Christianity. As the Iberian people began to follow Christ and His teachings, it seems logical that they would pay particular heed to the writings of James' and Paul's. These two apostles loved Spain, and they had both issued cautions about the evil that come from the love of money. 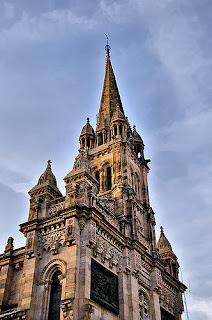 But as Christianity grew in numbers in Spain, the established church in Iberia became rich and fell in love with money. Church treasuries burst with silver and gold. Church bishops and leaders received appointments through patronage (e.g. "their gifts to the church and king"). 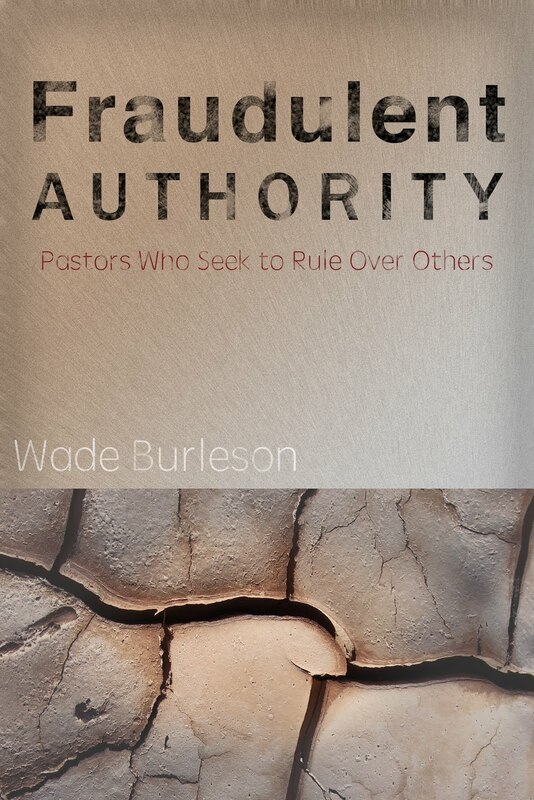 The rich began to rule and lord over the poor in the church, a direct contradiction of James' warning (James 5:1, 5-6). The Iberian church treasured their silver and gold more than their Savior and God. The Evil Began in A.D. 711. Like 9/11 in America, an event occurred in Iberia (Spain and Portugal) in A.D. 711 that traumatized the Christian people. The Muslims from North Africa, called the Moors, invaded the Iberian peninsula. With 10,000 soldiers, the Moors used violence and threatened to kill anyone who refused to convert to their Islamic religion and beliefs. As the Moors (Muslims) moved from south to north, seven bishops of the church gathered at Porto, a little sea port on the western shore of the Iberian Peninsula. The bishops brought with them the wealth of the church, vast caravans of precious stones, jewelry, gold, silver, fortified wine and other riches. Wine connoisseurs know that fortified wine is wine with brandy added, a practice originally begun to help preserve the wine, but which continues because of its unique and rich taste. What many people don't know is that fortified wine gets its name Port Wine from the city of Porto, the place from where this wine was first shipped to the world. The full name of the city of Porto is Porto Cale, or literally "Port of the Gaels," from which the name Portugal is derived. The nation of Portugal comes into existence only after the Europeans defeat the Muslims and retake the Iberian Peninsula during the Reconquesta. But before the Reconquesta, when everything looked dark and hopeless, seven bishops boarded ships and left Porto and sailed west into the unknown Atlantic ocean. All they wanted to do was get away from the Muslims - with their wealth. Remember, these were the "pastors" of the Iberian Christian churches. Sometimes the greater evil in a country is not the spread of radical Islam among a people as much as it is the subtle and deadly seduction of Christian churches and leaders to the love of material things over spiritual things. Where did these bishops go? 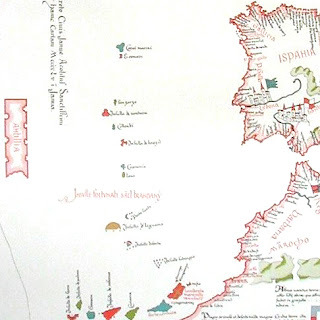 For the next several centuries the people of Portugal and Spain believed the seven bishops left Porto and settled on an island called Antillia. In A.D. 1492, German geographer Martin Behaim (1436-1507) constructed the earliest globe of the world, one still in existence today. On that globe, Behaim shows Antillia in middle of the Atlantic Ocean. In the same year of A.D. 1492, Portuguese cartographer Martinho da Boemia presented to Portugal's King John II a map of the known world. It, too, contained the island of Antillia, representing the fabled island of the seven cities, and the furthest west anyone from Europe had ever sailed (see map below). 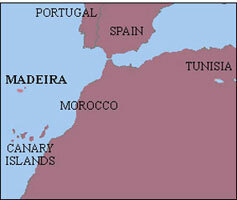 "In the year 734 of Christ, when the whole of Spain had been won by the heathen (Moors) of Africa, the above island Antilia, called Septe citade (Seven cities), was inhabited by an archbishop from the Porto in Portugal, with six other bishops, and other Christians, men and women, who had fled thither from Spain, by ship, together with their cattle, belongings, and goods." 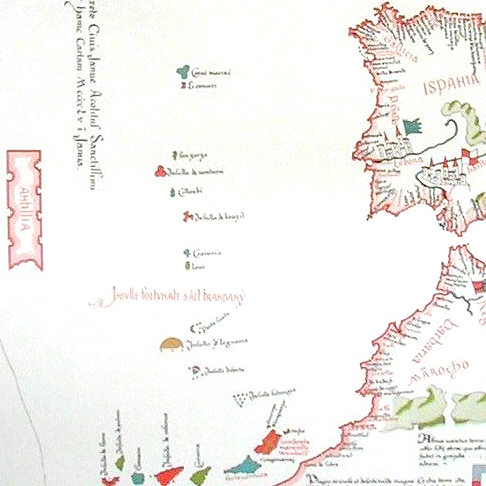 During the generations which had intervened since the settlement of the bishops on Antillia, a few Portuguese navigators had at one time or another, reached the island; but they were unable to return to Portugal, having been detained by the descendants of the bishops; who, understanding that Spain was still ruled by the infidel, were afraid that their place of retreat might be discovered, and invaded by the enemy (e.g. Muslims). The mariners affirmed, that while part of the crew were in church, the others gathered some sand on the sea shore, and found, to their astonishment, that one-third of it was gold dust. The islanders were anxious that the ships should remain until the return of the governor, who chanced to be absent. But the captain, who had heard of the detention of his predecessors, and was probably afraid that the same policy would be pursued towards himself, returned to his ship, and weighed anchor. Prince Henry on hearing the story of the mariners, expressed it is said, great displeasure at their having quitted the island without having obtained fuller information, and sent orders requiring them to return and ascertain everything of importance concerning it. It is probable that the mariners had privately learnt something of his intentions; for they took their departure on a sudden, and before his message reached them. Nor were they ever heard of again. Adams, H. C. 1817-1899. Travellers’ Tales: a Book of Marvels. London, New York: G. Routledge, 1883. Whether you believe the story that seven Christian bishops left Porto on the Iberian Peninsula during the 8th century with a vast amount of wealth, fleeing their people and country during a period of severe Islamic persecution, and eventually founding an island nation in the middle of the Atlantic with a vast of gold and silver is irrelevant. There is one key person in world history who did believe the story. Born in Genoa, Italy, Columbus entered the world during a time Europe craved the spices and silks of southeast Asia and China--not to mention gold and silver wherever it could be found. The Europeans traveled the famous Silk Road over land to trade with the Chinese. Ever since the day of Marco Polo (A.D. 1254-1324) and the Chinese leaders Ghengis Khan and Kublia Khan, the Chinese welcomed great caravans of Europeans who wished to trade with Cathay (China) and Cipangu (Japan). The Silk Road route was long and dangerous, but it was often traveled since the days of Marco Polo because of the spice and silk trade. However, in 1453, two years after Columbus' birth, the Ottomons (Turks) captured Constantinople, the starting point of the Silk Road for Europeans, and renamed the city Istanbul. The Ottoman Turks then forbade European trading caravans from crossing from Europe through Constantinople onto the Silk Road that led to China. European and Chinese trade virtually came to a halt. That's when the great Spanish and Portuguese ocean explorers of the 15th century began looking for a ship route west across the Atlantic to avoid crossing the Ottoman Empire lands Asia Minor (Turkey). Contrary to what you learned in grade school, 15th century oceanic explorers knew the world was round, but the early explorers who attempted to go west from the Iberian Peninsula across the Atlantic invariably failed to get far due to the ferocious headwinds. It was Christopher Columbus who discovered that you must begin your oceanic trip westward from a point further south, near the Canary Islands off the coast of Africa (near the modern day Western Sahara). From there, a ship's sails could catch trade winds blowing from the east (from behind) as the boat sailed west, and then on the return trip to Europe, the boat would take a more northerly route, catching the western trade winds that had made sailing west from Europe so difficult. Columbus moved from Italy to Portugal, married a Portuguese woman, and was living on the Portuguese Island of Madeira when he had the revelation of sailing to the unknown west from the south, beginning near the Canary Islands. When Columbus finally received funding from Spain's Ferdinand and Isabella to sail west to discover a sea route to Cathay (China) and Cipangu (Japan) after his own Portuguese king, King John II, had denied funding, Columbus was encouraged by many to find the island of Antillia as he crossed the Atlantic. As far as everyone knew, the island Antillia and the Seven Cities was the only piece of land between Portugal and China to the west. The continent of America was not yet known to exist in 1492. So, when "Columbus sailed the ocean blue in 1492," becoming the first European to make the transatlantic trip, and landed on a remote Bermuda Island on October 12, 1492 he thought he had found ancient Antillia, either an island paradise or a group of islands that contained on them the Seven Cities of Gold. 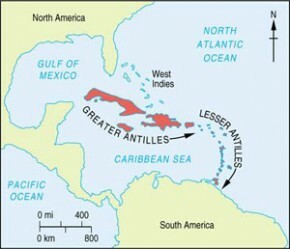 For this reason, to this day, the large islands of the Caribbean are called the Greater Antilles (from Antillia) and the small islands are called the Lesser Antilles. The lust for gold intensified when the Indians (misnamed "Indians" because Columbus thought he was closing in on the country of India) who met Columbus in the Antilles wore gold earrings and gold nose rings. Columbus eventually left a few men in the Antilles to search for gold and sailed back to Spain in early 1493. The rush for gold was on. Hernando Cortes was born in A.D. 1485 in Spain. He studied law, but at the age of nineteen, Cortez sailed to the Spanish colony of Greater Antillies (Haiti and the Domincan Republic). In 1511 Cortes took part in an expedition to conquer Cuba. In 1519 Cortes led an expedition to the Mexican mainland. With only 600 men Cortez conquered the ancient civilization of the Aztecs still seeking the mythical Seven Cities. The Spaniards had guns, horses (animals unknown to the Aztecs), and armor foreign to the Aztecs. The Aztecs believed that their god Quetzalcoatl had once left Mexico by sea and had promised to return. According to legend the anticipated year of the coming of the Aztec's Messiah was 1519 - the year Hernando Cortes arrived. The Aztec emperor Montezuma feared that Cortes was Quetzalcoatl. He dared not attack a god and so took no action against the Aztecs. By the time the Aztecs realized the truth it was too late. When the Spaniards first arrived Montezuma, King of the Aztecs, welcomed the Spaniards as friends and housed them in a palace in what is now Mexico City. However after a week Hernando Cortes took the emperor hostage and demanded that Montezuma come with him and stay with the Spaniards - or face death. The emperor gave in and from that moment he was a Spanish puppet. The Spaniards were now in control of Mexico. The Spanish conquistadors stole all the gold and silver of the Aztec civilization and pillaged the land they now called "New Spain." Cortes was appointed New Spain's first governor. Cortes brought in priests of the Roman Catholic Church to "Christianize" the Aztecs. Unfortunately, due to war, disease and famine, the Aztec population dropped by an estimated 90% as the people were wiped out by the Spaniards. Cortez would return to Spain in 1541 and die in 1547 at the age of 62. The legend of the Seven Cities of Gold was revived during the 1530s. Four people survived a shipwreck on the Gulf Coast of modern Texas of the failed Narváez expedition and managed to walk back to New Spain. One of the survivors, a man named Estevanan, told a colorful story upon his return. His Narváez expedition, which began in 1527, was aimed at the colonization of Florida. In 1528, while attempting to sail from Mexico to Florida, the crew was shipwrecked on the coast of Texas. The men who survived were captured by the indigenous people. After four years in captivity, the men managed to escape, and for the next four years wandered across what is today the southern United States. When they finally encountered Spanish soldiers at Sinaloa in modern day Mexico, only four men were left, out of an initial force of 600. Through their years of wandering, the men encountered numerous indigenous tribes, and one of the legends they heard was about seven cities laden with gold, said to be located somewhere in the Sonoran Desert (the southwest portion of what is now the United States). Coronado was the Governor of the Kingdom of Nueva Galicia (New Galicia), a province of New Spain located northwest of Mexico and comprising the contemporary Mexican states of Jalisco, Sinaloa and Nayarit. In 1539, he dispatched Friar Marcos de Niza and Estevan , the survivor of the Narváez expedition, on an expedition to present-day New Mexico. When de Niza returned, he told of a city of vast wealth, a golden city called Cíbola, whose Zuni residents were assumed to have killed Estevan. Though he did not claim to have entered the city of Cíbola, he said he stood on a high hill and that it appeared wealthy and as large as Mexico City. After receiving a report of the possible location of the seven cities, Spanish conquistador Francisco Vázquez de Coronado was appointed to lead an expedition to conquer the area. 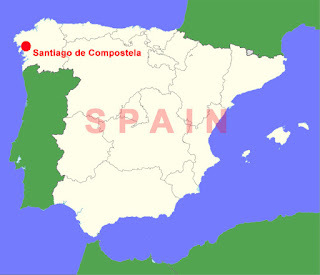 That expedition, gathered at Compostela for Mendoza's review in February 1540, included 1,000 men, 1,500 horses and mules, and cattle and sheep for the expedition commissary. Two vessels under command of Hernado de Alarcón were sent up the coast to support the land forces. Coronado's exploration of modern New Mexico, Texas and Oklahoma in 1541--80 years before the Pilgrim's landed in Plymouth--brings to a full circle Spain's attempt to find the fabled Seven Cities of Gold. Coronado's expedition ended near modern Wichita, Kansas without finding any of the seven cities, but from A.D. 711 to A.D. 1541 - 840 years of time - the quest for the Seven Cities of Gold captured the imaginations of the Portuguese and Spanish explorers and conquistadors. Though some would have you believe the Roman Catholic Church came to the new world to "convert the pagans to the Christian faith," the literal truth is the hunt for gold drove the explorations west. 1. The subjugation, enslavement and death of hundreds of thousands native American peoples. 2. The pillaging and plundering of foreign lands and resources for personal gain. 3. Wars and battles between "Christian" forces and "pagan" forces instead of peace. It would seem to me that much of the East vs. West and Islam vs. Christianity conflict over the past 1,500 years is simply fulfillment of the warning "the love of money is the root of all evil." It seems not just an axiom for a personal life; it is an eternal truth for the nations.